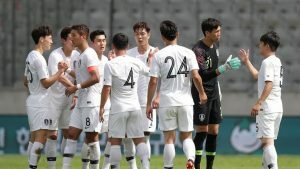 Despite being not able to qualify for the upcoming FIFA World Cup 2018, Bolivia didn’t allow South Korea to score a single goal in this match. South Korea gained a sizeable lead in ball possession, but couldn’t manage to get past Bolivia’s goalkeeper, C.Lampe. Both teams went goal-less in the first half as the referee blew the whistle indicating an end to the 1st half. Two substitutions were made by South Korea at the start of the 2nd half. But, it didn’t help as Korea’s attacks were constantly blocked by Bolivia’s defenders. On the other side, Bolivia who were showing excellent defence play, looked completely confused in attacking play. As, in the whole match not one of their shot was on target. But it didn’t matter to them as South Korea couldn’t convert their chances and the match ended in a draw. India started the match with 7 changes to their side. Clearly, New Zealand were the favorites to win this match. Meanwhile, India’s tactics were clear in this match as they were playing with a 4-3-1-2 formation in an attempt to choke New Zealand for space. India took their chances early in the match as the Kiwi goalkeeper almost gifted a goal to India’s captain. On the other hand, New Zealand also took their chances in the 1st half of the match. But they also couldn’t convert them into a goal and the first half ended without a single goal scored. Jeje Lalpekhlua will not be starting in his 50th match. However, a completely different story unfolded in the 2nd half as Sunil Chhetri scored at tht 46th minute to put India in the lead. But, New Zealand were quick in their counter attack as De Jong scored swiftly and levelled the scoreboard. India were lacking in their play on the left side and it was only a matter of time before New Zealand took advantage of it. The game was at its dying moments as only 5 minutes were remaining. This is when New Zealand’s Dyer latched on a through ball which came from Sarpreet and finished it off with a goal. This goal was enough to win the match for New Zealand and hand India with a loss. It was a comfortable victory for England over Costa Rica as they continued their preparations for the upcoming FIFA World Cup 2018. 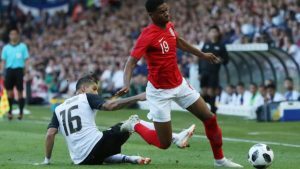 Marcus Rashford gave England an early start by scoring at the 13th minute of the match. Rashford had been threatening from the very beginning of this match. And, this goal was the reward of his sheer pace and mobility. Costa Rica came under pressure from the very minute this goal was scored. However, they couldn’t muster up a single goal in the 1st half as it ended with England in the lead by 1 – 0. In the 2nd half, England continued to attack on their opponents goal-post. But, this time Costa Rica were blocking them off quite successfully. But England weren’t holding anything back at this point and they needed a goal to seal off the match. And, this need of theirs was fulfilled by Danny Welbeck who scored at the 76th minute to make it 2 – 0 for Costa Rica. This goal was more than enough to get the English side over the line. Costa Rica would be disappointed however, their lack of shots on target and inability to convert their chances were the main reasons as to why they lost this match. By winning this match Portugal showed that exactly why they are one of the contenders to win this year’s FIFA World Cup 2018. Guedes put his team in the lead by scoring at the 17th minute of the match. Algeria weren’t given a chance to recover as Fernandes netted the ball at the 37th minute to make it 2 – 0 in the 1st half. The Algerians weren’t getting their shots right and so no goals were scored by them in the 1st half as it ended with Portugal in the lead. The 2nd half went underway and football fans were expecting a goal from Ronaldo. However, it was Guedes who struck his 2nd goal of the match to make the scoreline 3 – 0 at the 55th minute. Algeria now had to play extremely well in order to draw much less win this match. But, despite having a decent possession on the ball Algerian strikers couldn’t get past Portugal’s defenders. Not even a consoling goal was scored by them as Portugal won their last friendly match prior to the FIFA World Cup 2018. The 1st half belonged to Iceland as Arnason put them in the lead at the 6th minute of the match. 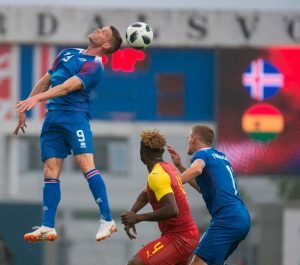 This allowed Iceland to take the upper hand in the match as Ghana were under pressure of scoring a goal. Taking advantage of their position, Iceland’s Finnbogason scored at the 40th minute and the score was now 2 – 0. This was also the final score before the referee pulled his whistle and the 1st half came to an end. The 2nd half was a pure example of a comeback and it was staged by Kasim Nuhu and Thomas Partey. Kasim struck at the 66th minute while Thomas netted the ball at the 87th minute to level the scoreboard. However, unluckily no tie-breaking goal was scored by either side as the match ended in a draw.